Some of us like to cook, while many hate the thought of going near a kitchen. But what if the kitchen is user friendly and easy to work in? What if the kitchen does most of the work? In the future, you might be able to buy an entire meal in a package, only this package is nothing like what you see in the grocery stores today. The food package of the future has all of the ingredients for a meal and a DVD. Just load the DVD into a built-in player and a chef will come on the kitchen TV and show you step-by-step how to make an outstanding meal. Dutch researchers have developed a smart radio frequency identification (RFID) chip that is small enough to be placed on flexible food packaging. We might see the end of “best before” dates with the product actually telling you how fresh it is. This technology could be used to allow mobile phones to speak directly to the product and be told all the information about the food’s freshness. There are many high-tech refrigerators on the market, such as the LG, which keeps track of what is in the refrigerator so that you know what to shop for or if you have the right ingredients for your next meal. But, Samsung has a system, called Silver Nano, which is found in many of Samsung’s refrigerators. By distributing microscopic silver ions throughout the fridge, the Silver Nano system interferes with the respiration of bacteria and fungi, inhibiting cell growth. This helps to protect you, your guests and your loved ones from food-related illness. Many cooks prefer gas burners for the kitchen stove because of their simple easy-to-manage design. The problem with a gas stove is that the cook is actually playing with fire, which adds an impending fire risk to the kitchen. A gas stove also wastes half of its heat. An electric burner is not much better, taking too long to heat and can be difficult to regulate. The newest invention is induction hobs, which uses electromagnetism to directly heat the metal of the cookware, rather than the surrounding air. Since induction only heats metal, the cook can touch the cook-top while it’s working and not get burned. You will no longer need to keep an Aloe Vera plant around. When a good-sized piece of magnetic material, such as a steel skillet, is placed in the magnetic field that the induction element is generating, the field transfers energy into that metal. That transferred energy causes the metal of the pot or frying pan to become hot. By controlling the strength of the electromagnetic field, the amount of heat being generated in the cooking vessel can be controlled. While most microwave ovens are pretty simple to use, they are not totally accurate in their cooking time and might overcook a meal, making it tough to eat. The microwave of the future has a one-touch sensor, which automatically adjusts the settings of the microwave to perfectly cook or reheat food with the touch of a single button, taking the guesswork out of time and power levels. 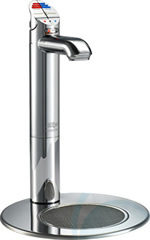 Presently, we have kitchen taps that deliver instantaneous boiling or chilled water, but let’s add a third kind of water with the Zip filter tap that produces sparkling water for use in making bubbly cocktails. The Zip HydroTap produces boiling filtered water instantly for tea, coffee and cooking, while it also produces crystal-clear, great-tasting chilled filtered drinking water, as well as sparkling chilled filtered water. The Moshi by Electrolux is a multipurpose kitchenette that includes the induction cooking hob, dish washer, sink, fridge and washing machine in one structure. 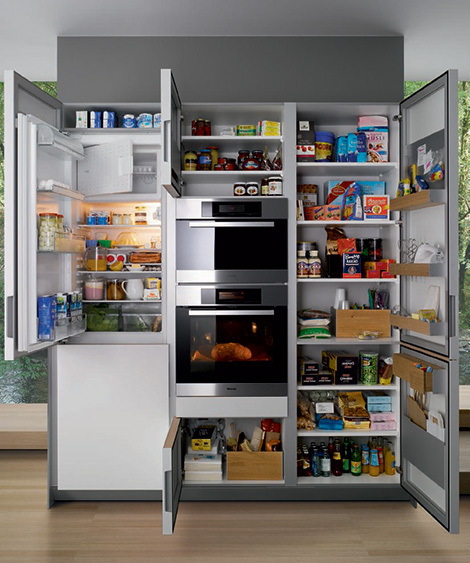 The entire gamut of appliances is controlled via an interactive touchscreen pad. It is designed for apartments that lack space and yet want all the comforts of a luxury home. Time-marking groceries to recipe cards, as well as the ingredient status of the refrigerator, are controlled and accessed via the pad. The control pad for the Moshi controls and programs the entire appliance. It has a preloaded recipe database with step-by-step preparation instructions. It even sends a message to the user when groceries are needed. If a problem occurs, the appliance will notify technical support. This futuristic kitchen looks as though Apple designed it with its clean slick lines. The height of the counter top, including the food cutting area is adjustable according to your needs so that you can adjust the height for a child that wants to help prepare a meal or make cookies. The cook can surf the web for a recipe using the digital screen in front of the cooker, or just tune in to music to cook by. On each side, there is a stand. One stand has induction hobs and an oven, while the other has a sink and a drying rack fitted into the stand, which contains a dishwasher with two separated racks. Above the work area is a hood and a heating area. A light made of optical fiber under the surface holds easy to reach glasses. If you are looking for an eco-friendly kitchen, the Ekokook (eco – cook) is a kitchen system that makes use of all of your waste, all of it. Through an intricate system you can reduce your ecological footprint and enhance the earth’s environment by effectively turning each waste into a new resource and each drop of water into reusable liquid. Ekokook has three micro-plant systems that help to reduce the environmental footprint. Microplant 1 is used for solid wastes, such as glass, paper, plastic, and metal. Each of these is placed in its own bin and compacted. A steel ball, like the ball in a pinball machine, is used to break glass, while an endless screw, like a nut-cracker, compresses cans and plastic water bottles, and a manual shredder/crusher shreds paper before turning it into briquettes. Microplant 2 is used for liquid waste collection, and recycling. There is a double sink for retention with a second sink that collects water that’s been filtered of any grease scum into two pitchers that can then be used on household plants. This water device can save up to 16 quarts a day. All of this can be lifted out and cleaned. Microplant 3 is used for organic wastes. This is the earth worm composer. It uses real earthworms to break down organic wastes. Green wastes go in here like peels, scrapings, and leftovers. The container with the worms is a drum that rotates a notch a day. The waste inside shifts gradually and after three months, maturing waste is considered compost. Liquid effluent drains into two pitchers and diluted one part effluent to ten parts water, which becomes perfect food for indoor and outdoor plants. The futuristic Ekokook system will truly bring a healthy and appealing change to your kitchen as well as the community. If storage is a problem, consider the all-in-one SieMatic S1 kitchen, which includes a refrigerator, storage cabinet, microwave and oven. Everything is at your finger tips. Is the next step in our kitchen of the future replication of food, similar to Star Trek? Just maybe. We have 3-D printing for solid objects; can food be far behind? An experimental 3D food printer "prints" frosting on a cupcake. Fully-cooked meals are getting closer and I don’t mean microwavable frozen meals. The technology enabling this ambition is a 3-D printer that various researchers are developing that can make three-dimensional objects with everything from soft plastics to ground beef. 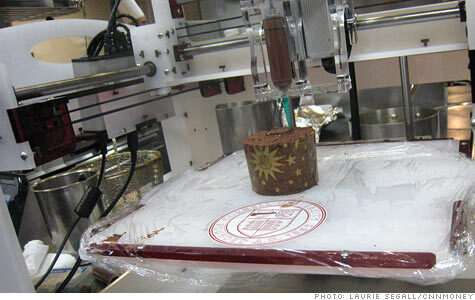 A 3-D food printer could be available within the next ten years. The machine layers the food material as long as it can stay soft until the item is fully printed because the food must pass through a nozzle. Working with the French Culinary Institute, a team at Cornell printed a really thick corn chip that was perfect for frying. They also printed a turkey using ground turkey. It still had to be cooked in an oven. The first application most likely will be baked goods. One of the first items Cornell printed was dough from an old Austrian Christmas cookie recipe. Instead of the standard cookie, it had a C for Cornell printed in the middle. This extra touch has the wedding cake and bakery market interested. The replicator can't handle solid items like raw vegetables or strips of meat, and you have to load the cartridges with the materials yourself. You then will have to cook the food after it is made, but that may change, as the units become more sophisticated. Science fiction is only a few steps ahead of us in technology. Our comfort level with futuristic kitchens will grow as the technology and kitchen designs develop new concepts for ease of use.